Although Beer Tinted Spectacles was not set up with the objective of reviewing beers, there are times when a singular beer warrants that attention; when a beer triggers memories or is so enriching that it creates new ones. And the beauty of this is how subjective, personal that experience is, how evocative of a moment in time. This was a case in point. We’d arrived at the airport in Florida earlier evening, and after the bright, breezy coolness of the UK in April, the humid heat of the central Florida swamplands slapped me like a warm towel after a particularly energetic Thai massage. The sort of massage necessitated by limbs and bones crushed and twisted from economy seating, and the endless fanning by rank cabin air, recycled through 350 sets of hairy nostrils. It was the bliss of a cavorting into a sauna and throwing water on the coals or skimpily running through the snow, between the pines and jumping into a Turkish bath. Acculturation isn’t such a major concern when you’re a Brit travelling to the U.S. – so much of our lives and lifestyle is shared, familiar. Yet, there’s still a huge difference actually being there, immersed in it, rather than watching on it on Dave. My orientation is built around two things: geography (“Where the hell am I? Which way is north?) and shopping (“What do the locals eat round here? Oooooo look, Peanut Butter and Honey Oreos!”). Due to my line of work, I’m pretty familiar with US food retailing; nonetheless, wandering up and down the aisles still gets me excited – product ideas get swiped with careful abandon. Then there’s the beer. It’s like youthful love: heart fluttering, shallow breathing. I approach the aisle: the options, the choices; unheard of brands, local brands, or rarities in the UK, readily available here. And there’s the way beer is sold: the main fixture was 100% chilled (anathema to some I know, not to Tinted); 6 packs, wide bore large cans, narrow bore small cans – and so much craft (50% of the space) and many, many more craft beers in cans than the last time I was Stateside. And Big Beer was interesting too – no point in being sniffy; nice to see the old school Coors Banquet ‘stubbies’ and gratuitous use of thermochromic ink*. Great too, to see interesting displays and on pack promotions; there’s always room for another koozie or bottle opener in the Tinted House. One beer stood out for me though: both because it looked tremendous, but also because it’s a beer style I have a particular fondness for. I love Bavarian wheat beers, not just for the unadulterated refreshment they offer, but also for their hidden complexity and their presentation. When I drink a good one, I think of Münich beer gardens or shady terraces gently stepping down to the river. I think of warm Summer evenings; bratwurst cooking over wood; of raucously green fields, readying themselves for harvest. I think of an impromptu disco at The Turf Locks in ’91 where we danced to the Cult at one moment and a Steeleye Span reel the next (Hey! Blame the DJ) fueled by pints of Tanglefoot and Royal Oak. In my mind’s eye, I see the foothills of the Bavarian Alps, the rolling fields and away, away in the distance the snow-capped rising spires ascending. Fuse that with the entrepreneurial passion of the New World and the dancing bars on the graphic equalizer go banzai. 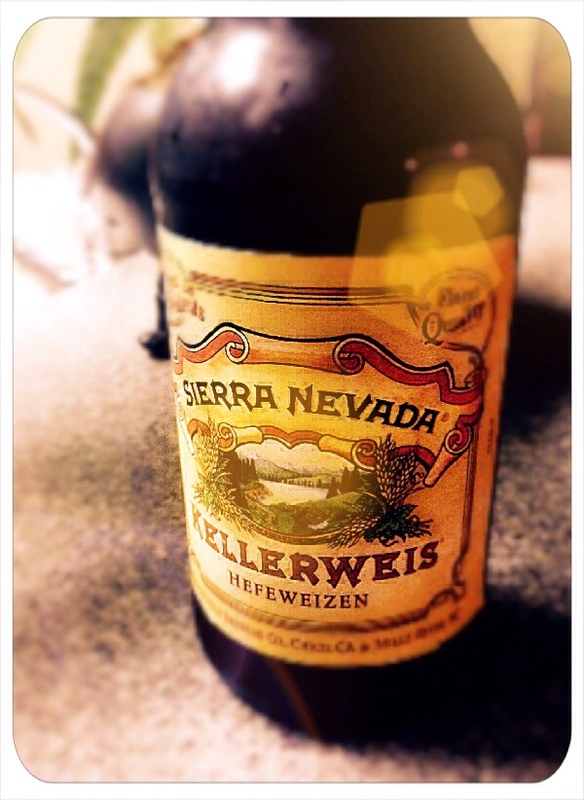 This is everything that Sierra Nevada Kellerweiss meant to me: the best of the old world and the new, all swaddled together in a autumnal coat. I was going to buy a six pack but only got two bottles as I was in the market for breadth that day (alas, alas). And what can I say? It was as well-structured and brewed as any Sierra Nevada beer: the esters like a home-baked banana bread, not full on ripe skins. The body, through its natural carbonation from a healthy slug of yeast was dancing and swirling (this is a Hefe weizen, ‘yeast wheat’ after all); the body was a translucently pale, frosty yellow. As wheat beers go, not as complex as Schneider Weisse, but as drinkable as the lighter styles, such as Erdinger – yet, all the time with a grainy hoppiness that marked it out as just a little different. A beautiful beer. I have spoken to someone at Fullers and with Victorian haughtiness, demanded that they import it. He didn’t say no. *Given that I pioneered its first application on beer, it warrants a mention, don’tcha think? Sierra Nevada Pale Ale, which, after naming as my “One Beer to rule them all” in a recent post, would be rather remiss of me to leave off the list. It is naturally a beautifully brewed, versatile, flavoursome and aromatic Californian beer. It is also the one I genuinely think most about on my Friday nights – the most hallowed of all beer occasions. Windsor & Eton Conqueror: in my book, not a session beer, yet the whole concept of dark beers that don’t taste roasted or charred is intriguing. Conqueror manages this – a beguilingly dark beer, with a fromage frais coloured head and only a lightly roasted note which you pick up in the sides of your mouth. So a burly beer but one which still allows the hop leaf character to show through – too much so in some of their other beers, but judged nicely here. Menabrea Blonda: someone who I used to work with would choke on her cornflakes knowing I put this beer on my list. Brewed in picturesque Biella in the Piedmont region in Italy, the beer itself is a fairly ordinary pale lager. But it’s the associations that swing it for me – a great match for Friday night pizza, a bar in downtown Milan, the brewery nestled up a tight street in the foothills of the Alps. Shallow I know, but I can live with it. St Austell Tribute: something has happened down in Cornwall. I used to live in Devon and my recollection of St Austell (company not place, although it could have described both) was ‘good pubs, dodgy beer’. And it was all acronyms like ‘St Austell HSB’ or ‘Bodmin PMT’ that sort of thing. Perhaps it was Sharps. Doom Bar taking off and being bought for nigh on £20 mill must have woken up the Cornish to their terroir as there are some cracking beers emerging from west of the Tamar now. Tribute makes the list – I can get it in my neck of the woods, and it’s a drinker, but Betty Stogs would be on it too if it was more available. Schneider Weisse: this is the daddy of the Bavarian wheat beers for me. Erdinger is a little too clovey, a little too texturally thin and a touch too ethanolly in taste for me. Schneider though, nails it. In decent distribution now in the UK too, which is handy. Jennings Cumberland Ale: another associative beer for me – this one is the Fox and Hounds in Threlkeld, the slopes of Blencathra looming behind. Or the Old Dungeon Ghyll in Langdale. Supping slow pints after a day getting lost on Crinkle Crags (again). Goose Island IPA – Chicago, 1999. I had been in the US studying for my MBA international assignment and stayed over to meet my brother who was living in the US back then. He flew to meet me in the windy city and we had 48 hours of tourist highlights. These included a ‘Half Rack of Ribs’ (note: a half rack, between us) taken I think from a white rhino in the Anchor Chop House. And a deep dish pizza in Pizzeria Uno. An 8” being enough stodge for 3. But hell, the beer was the revelation. Goose Island beers in what we thought would be our crappy ‘Hospitality Inn’ bar, but turned out to be a drinkers’ honey pot. Glasses of IPA and Honkers: untouchable. ¹Football fans please forgive me. I did not watch this match nor any other. Ultimately, it’s lots of grown adults getting all het up about kicking a pig’s bladder.